You may be on this page because you received this email from Georgia Tech Human Resources. If so, follow the directions below if you need to prepare for GradHiring. What: GradHiring allows new graduate students working for Tech (GRAs, GTAs, and GAs) to complete their onboarding process all at once. This process will trigger information to Banner to post your fee waiver and set-up your direct deposit to receive your paycheck. When: August 15 – 16, 2018 | 9 a.m. to 4 p.m. Your job offer can be directed to your hiring manager. Onboarding or employment can be directed to hr.ask@ohr.gatech.edu or 404-894-4847. Your enrollment status can be directed to Graduate Studies at gradinfo@mail.gatech.edu. GradHiring as an event? Learn more here. Completing these forms in advance and bringing them with you will greatly reduce the amount of time you will have to spend at the processing event. Step 1: Click here to access the new hire documents. This packet contains an Authorization Agreement for Automatic Deposits, which allows Human Resources to automatically deposit your paychecks in your bank account. If your bank has provided you with personal checks or a print out with your routing and account number, you may bring them with you for faster processing. Don't have this information in time? Set your direct deposit after GradHiring. When you arrive, you should have all the new hire paperwork with you and completed to the best of your ability. Before attending GradHiring, you will need to complete and bring in several forms and make copies of your immigration documents. The information found at the link below will guide you through the steps you must take before arriving. Completing these forms in advance and bringing them with you will greatly reduce the amount of time you will have to spend at the event. You should have received an email from support@online-tax.net. This message is from the Georgia Tech tax compliance software known as GLACIER. 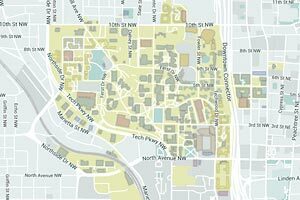 All foreign nationals working at Georgia Tech must utilize GLACIER. Once you have arrived in the U.S., please log in as instructed in the email and follow the directions. Print the PDF forms provided at the end of the data collection process and bring them with you to GradHiring. If you are new to the United States and do not have a Social Security Card, please complete and bring the Social Security Card Application Form with you. When you arrive, you should have the new hire paperwork with you and completed to the best of your ability. Please Note: A student that has been previously employed and/or paid by Georgia Tech but has not worked within the past 2 calendar years must complete the New Hire Employment package and make an appointment to visit the GTHR office before August 25th to update your records. If you are a Foreign National rehire whose work authorization document (I-20/DS-2019) has been extended or renewed, please schedule an appointment and visit the GTHR.